Please read below for the special rules for 6v6 games and some information about the Town League Referee program. Inter-Roster Games: Most refs enjoy these games because the team is playing itself, and the game can be stopped for “teaching” players. If a player does a throw-in wrong, you would blow the whistle like in any other game, but the coach may decide to have players practice throw-ins for 5 minutes of his “game.” Or corner kicks, or goal kicks, etc. Game can be stopped at any time the coach wants. The coach can have as little or as much involvement in the game as he/she wants – the coach might ask you to explain a rule, or he/she might explain it. The coach can also be on the field during the game. You are there to referee as you normally would, but the coach might ask you not to call every illegal throw-in, or let certain things go so the flow of the game isn’t disrupted. You must, however, call fouls for safety reasons. No slaughter rule: If a team is down by 3 goals, they can add an extra player until the score is within 2 goals again. For example, if the score is USA 5 and France 2, France can add a player until they score another goal and the differential is within two goals. Roster Size: If a team does not have enough players (which should be impossible due to the size of the new rosters), they can borrow a player from ANOTHER TOWN LEAGUE TEAM. The player has to be U10, and MUST be part of Belmont Soccer for liability reasons. Each roster is large, so each team is split in two and play in two separate games. So making sure you go to the correct field is crucial. For example: USA and France are playing one another in week 1. On field 1, half of team USA will play half of team France. On field 2, the other two halves of the teams will play. Once USA and France splits their teams in half, they cannot move players back and forth again. Rosters at games: While technically every coach should bring a roster to the game, for whatever reason this past year, coaches are forgetting them. If a coach comes without at least one roster, ask for the roster to be sent to you electronically- maybe in a text message. Please let the game be played on time, but send me and Mark an e-mail indicating that the coach didn’t have his/her roster. Rosters should be brought so you can have the names of players in case there’s a discipline issue, which probably won’t happen, but it is good to have the names. Many refs also use the roster to report who scored goals when issuing a game report, while others are not that detail-oriented. Some refs use the roster to put the final score of each team on so when they get home later, they don’t forget which team had which score – which can happen if you ref several games in the same day! It’s also good to have so if a coach causes an issue (Zero Tolerance Violation), you have all the team information in front of you when e-mailing the Referee Directors. So, we think it’s important to have at least one roster, but worst case scenario, the coach can send it to you on your cell. Zero Tolerance Violations: No parent or coach is allowed to talk back to you, argue about a call, or say anything other than “thank you ref” after a game. If a coach / parent ever approaches you to indicate displeasure with your performance, it is very important that you notify the Referee Director. Please write down everything you can remember about the incident immediately after the game, or even during half time (if it occurs during the first half). Remember to include the name of the coach (if you know it). If it is a parent, ask the coach the parent’s name. If you don’t know either, include as much detail about the person as possible (what the person was wearing, hair color, skin color, glasses, facial hair, etc). Then write down all the details you recall. When the game is over, please discuss what occurred with your parent and together, notify the BSA referee Director. BSA will notify the Town League Director and Coordinator and they will investigate the incident. Finally, because these situations tend to make young referees uncomfortable, we will make sure you are not assigned to that team’s games again. This will NOT reflect poorly on you, so please do not feel uncomfortable reporting any violation, even if you aren’t sure of the severity of the issue. Support: BSA are always here to support you, so never feel uncomfortable approaching one of teh Referee Directors via phone, e-mail, or if you just see us at the field. Even if it’s just to discuss a tough game and you’re not sure if you made the correct calls. You do not have to have a ZTV in your game in order to reach out to us for support. The Referee Directors are certified referees, so we “should” know how to help! You and all other referees come first with us – our job with BSA is to guide the young referees in such a way that you are confident young men and women who will hopefully stay with the Belmont Soccer Association referee program until you graduate high school, and perhaps even when you return home from college! To that end, you need to feel good about the work you are doing for this wonderful organization! Game Assignments: We will be sending your parents (and you if you provided an e-mail address) game requests every two weeks. You will only have a day or two to respond with the times you are available to referee. You can indicate that you prefer to referee girl’s games (which many do when starting out), or tell us you prefer to referee at a particular field that you live near. Boys play at Town Field and Girls will play at Winnbrook, so it will be impossible to assign you a girls game at Town Field! If we have a lot of referees requesting games, and you only want to ref girls games, it might decrease your chance of getting a game that week. We will do our utmost best to try to get you in at least one game per two week block, because quite frankly, the only way you will improve is to get on the field and ref the games! Once we create the referee assignments for those two weeks, we will e-mail you your game(s). We will include date, field, time, and the names of the two teams. We ask that you notify us immediately of any conflict, or if you become sick, so we can try to find a replacement referee. If you have a sibling refereeing in the program, please let me know if they take your slot so we can make the adjustment to our payroll. If your game is canceled, we will contact you before any other referee to see if you can ref when the teams decide to play their make-up game. Uniform: Please make sure you obtain (buy or borrow) a full reffing uniform (jersey, black mid-thigh shorts (not spandex tight ones), black socks, sneakers/cleats, whistle (or two in case one drops on the geese poop field), pen/pencil and small notebook or paper to record goals, and a timer). If it’s cold out, wear black leggings under your shorts, or black fitted athletic pants, a sweater or coat under your jersey, and a hat or ear warmers and gloves. Stay warm! No Shows: If we schedule you to ref a game, and the team doesn’t show up for some reason, you will be paid. Please notify us if this happens. Inclement Weather: BSA will cancel games by 7:30am Saturday morning. However, morning games may be played but later BSA closes the fields for all afternoon games. Therefore, if it’s raining, please check the website before you head to the field. Once the referee Director is notified that games are canceled, and you’ve given us your cell phone numbers, we will text you. Otherwise, we will send an e-mail blast to all referees. If BSA does not cancel games, but you arrive to the field for your game and there are free standing puddles, or large patches of mud, or it begins to rain heavily, you have the authority to cancel the game. 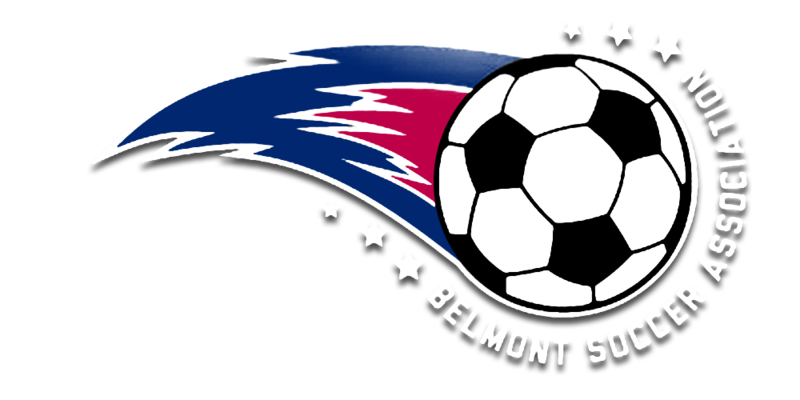 Talk to the coaches and see what they think, but ultimately, if it is a safety issue for the Belmont children, you must cancel the game. If the coaches decide to stay at the field anyway, that’s up to them. You should not referee the game if you feel it is not safe for the kids to do so. For lighting/thunder, use the 30/30 rule. If you see lighting, count until you hear thunder. If it is 30 seconds or less, have everyone seek shelter for at least 30 minutes after the last time you’ve heard thunder. If you do not see lighting, but hear thunder, you treat it the same way. Seek shelter for at least 30 minutes after the last time you hear thunder. Since TL games are scheduled so closely together, there’s not a lot of room for game delays. If it’s the second game of the day (2:30/3pm game), the game might be able to be played with a delay. But the earlier games only have 30 minutes to spare before the second games begin. Quite frankly, these are 10 year old kids, it’s safest to simply err on the side of caution. If it’s only drizzling out, and you see lighting but don’t hear thunder for over 30 seconds, you can continue the game. But if it’s raining heavily, or you hear thunder, just tell the coaches that you are canceling the game for the safety of players and spectators. Most won’t want to hang around for 30 minutes anyway! Payment: You will be paid $20.00 for each game you referee. Since you are all just starting out, you will either shadow a more senior referee for two games (at $10/game), or we may match you up with the more senior referee and have you both referee the game together. We will e-mail the coaches whose games we assign you to so they know you’re not just on the field socializing. Thanks again for being a ref in our Town League program.